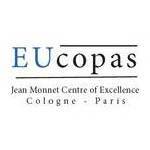 EUCOPAS is a Jean Monnet Centre of Excellence consisting of the Jean Monnet Chair, Prof. Wessels, University of Cologne and the Jean Monnet Chair in European Union Law and Political Science at Sciences Po, Paris. The programme runs from September 2015 to August 2018. EUCOPAS’ objective is to promote and mainstream EU-related key subjects in different disciplines and to reach out to the wider public. It brings together young and experienced researchers as well as students and the general public who have not yet been in regular contact with EU-related topics. It provides students with practical insights into the EU-system in order to enhance their academic skills and their employability. The objectives will be achieved by establishing a research-based teaching programme comprising conferences, PhD workshops, MA summer schools and public lectures. On 13 December 2018 the EUCOPAS Dissemination Event took place at the Institut Français Köln. Please find the EUCOPAS-PROTEUS summers school report here. For further information please klick here. "Before a new Franco-German integration initiative for the EU? Testing the proposals of president Macron"
Call for Applications for the EUCOPAS PhD Workshop 2018 on "Democracy in the EU and its member states"
60e anniversaire des Traités de Rome : Révérer le passé et craindre le futur ?